20 points to an IQ. 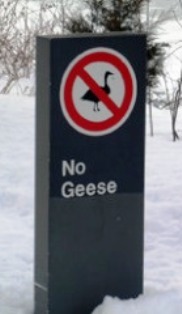 The sign that reads, "NO GEESE,"
goose calls at passing women. It’s best to try to ignore them. Tony Gruenewald was born in Manhattan, but grew up in the shadow of the water tower of the Edison Ford Assembly Plant in New Jersey. He has worked as a fast food fish fryer, on a loading dock, in broadcast journalism, and as an advertising copywriter. He currently works for the nonprofit Learning Ally and is pursuing a Masters of Library and Information Science at Rutgers University. 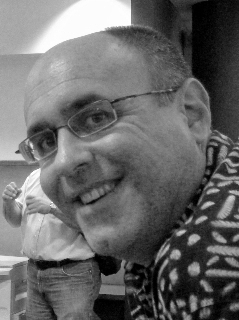 Tony is the author of The Secret History of New Jersey (Northwind, 2009) and his poems have appeared in The New York Times, Adbusters, Exit 13, Slow Trains, U.S. 1 Worksheets and Edison Literary Review. Learn more at www.tonygruenewald.com. as a jersey girl & academic, I can only love this one! The geese keep coming; are they reprobates or is there a literacy problem in Princeton? Tony, you have a wicked sense of humor and geese are a perfect subject for your wit. What an enjoyable poem to start a day! LOVE IT TONY!! Here in S. TX we have entitled Green Parakeets from Mexico. Our signs are in Spanish!!HA!! Jayne,I have to thank you for choosing excellent poems like this one, that also make me smile, in the morning,BEFORE coffee! Not an easy feat. Tony, this one's a gem. This is great. So funny! I love the images of these "entitled" fowl. me too. superb! the sign is amazing. Love the poem and the accompanying photo!